Balloons are a symbol of celebration, used to mark life’s special occasions. It can be easy to forget about the consequence of a released balloon during these memorable moments—but the aftermath can be deadly. Whether balloons are intentionally or accidentally released, they can end up hundreds of kilometres from where they were released, causing great harm to the environment and wildlife. Birds and turtles not only ingest balloons, they actively select them as food. This is because a burst balloon often resembles a jellyfish, the natural food sources of many marine species like turtles. Ingesting balloons, and the clips and strings attached to them, can cause intestinal blockages and results in a slow painful death through starvation. Marine animals don’t have the gastrointestinal pH levels to breakdown a balloon and for turtles, it may also cause floating syndrome. Trapped gases in the gut can cause a turtle to become buoyant, unable to dive for food—making them vulnerable to boat strikes and leading to starvation and severe dehydration. Wildlife, both terrestrial and marine, can also become entangled in balloon ribbons or strings, causing injury or death through drowning, suffocation, or an inability to feed and avoid predators. Sadly, nearly half of all seabird species are likely to ingest debris eating everything from balloons to glow sticks, plastic pellets, foam, metal hooks and fishing line. It has also been found that birds are collecting balloons and clips, thinking that it’s food, and feeding it to their young. 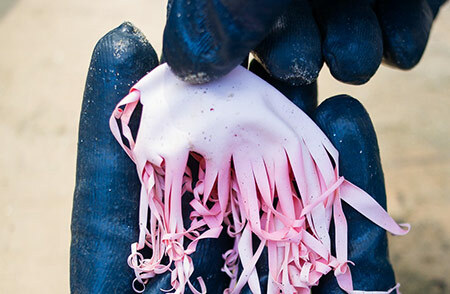 Take a look at the deadly effects released balloons are having on birds (Lord Howe Island). In Queensland, the release of balloons into the environment is considered littering under the Waste Reduction and Recycling Act 2011—whether released deliberately or by accident. While a person may have the permission of the occupier of a place to release a balloon, once the balloon leaves that place it becomes litter. The law does not differentiate between different types of littered material and whether the waste is biodegradable or not. The release of single or multiple balloons can constitute either littering or an illegal dumping depending on the volume of material released. Whether released deliberately or by accident, balloons can end up a long way from where they started. Helium balloons have been known to travel up to 800km before the helium escapes and they fall to earth. This means they can end up in all types of landscapes including properties, waterways, oceans, bushland, recreational areas, and farmlands. Helium balloons can also burst at high altitudes, expanding from decreased atmospheric pressure. Burst balloons often return to earth in many smaller pieces, with larger sections resembling jellyfish—posing extreme risks to the animals that select them as food. The volume of plastic waste in the environment is a major worldwide concern especially in the marine environment with an estimated 8 million tonnes of plastic ending up in oceans each year. In Australia, approximately three-quarters of coastal rubbish is plastics. Mylar: foil-coated plastic balloons which are not biodegradable and stay in the environment forever. They are similar to plastic bags and break into smaller pieces (micro plastics) in the sun (photo degradation). Latex (rubber): typically degrade more quickly than other types of plastics (much slower if in water) but can take years to fully break down depending on the conditions and the chemical and dyes used to manufacture. Balloon accessories like plastic clips and ribbons are also not biodegradable. All of these materials, if littered, can cause entanglement, injury and death to pets and wildlife, and also adds to the huge volumes of plastic waste in our environment. flowers or planting a tree in memorial. ensure all balloons and accessories (like clips and ribbons) end up in the bin.